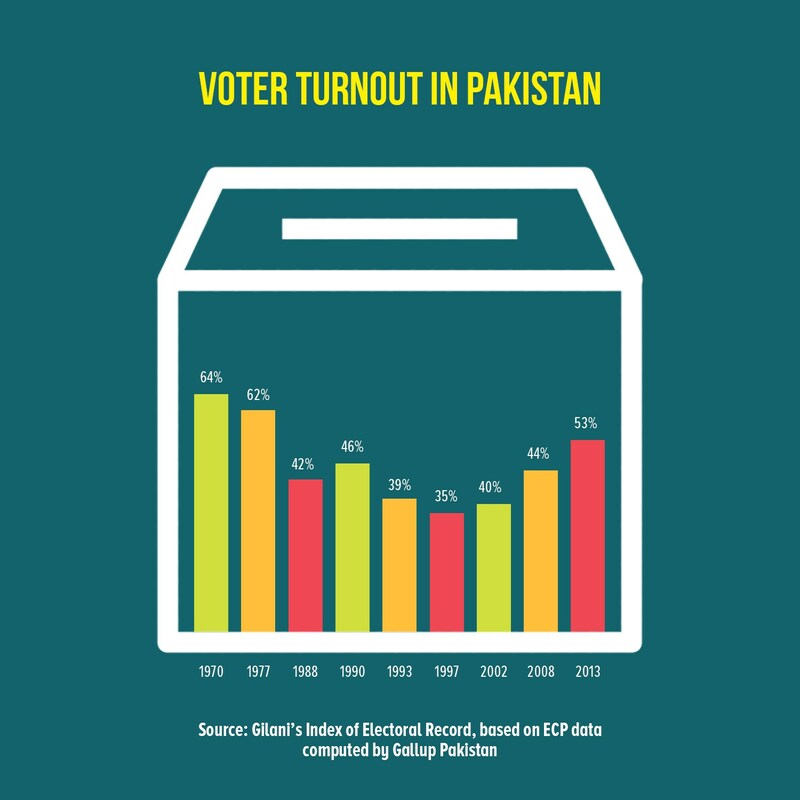 Pakistan has 200 million people and 105m of them were registered to vote in today’s general election. This makes it the fifth largest democracy and second largest Muslim democracy after Indonesia in the world. Who won? Well, it seems that voter turnout was unchanged from the last election in 2013, at just 53%. So the ‘no vote’ party was the biggest winner. But a relatively new party has won the most seats in the National Assembly. This is Pakistan Tehreek-e-Insaf (PTI) or Pakistan Justice Party, led by Imran Khan, a former international cricketer (the sport inherited from British colonial rule and godlike in the Indian sub-continent, muslim and hindu alike). Khan’s party has defeated Nawaz Sharif’s Muslim League. Sharif was the former prime minister of Pakistan before he was convicted of corruption. Sharif’s family came under judicial scrutiny over the Panama Papers. After disqualifying Sharif from holding public office the Pakistan courts was sentenced him to jail and he absented himself to the UK. Just before the election he came back to Pakistan to start a 10-year jail sentence. This martyrdom, as he sees it, was designed to increase the chances of an election victory for his party now led by his brother. But this risky move appears to have failed. Pakistan is one of the most unequal countries in the world. Just 22 families control 66% of Pakistan’s industrial assets and the richest 20% consume seven times more than the poorest 20%. Both the names Khan and Sharif mean ‘ruler’ or ‘noble’. According to a 2013 study, 45% of all holders of office across Pakistan came from family ‘dynasties’, moving from one party to another with bewildering rapidity, with their political direction decided by whom the military establishment selects. Khan has won because he had campaigned for several years on ‘fighting corruption’, for which the previous two main parties of government, the Muslim League and the People’s Party (led by the Bhutto dynasty), were notorious. The anti-corruption message has won over sufficient voters, mainly middle class. Khan appealed to this layer as a more ‘secular’ candidate (not surprising considering his personal affairs). Although, the PTI’s support comes from the urban middle classes, in the election he aligned his party with smaller extreme religious parties in order to try to gain a majority, stepping back on equality and ‘social’ issues. Moreover, he is regarded as the new favourite of the military, which wishes to continue its policy of backing the Taliban in Afghanistan and allying Pakistan with China against India. China is now Pakistan’s largest foreign investor. Khan claims he wants to ‘depoliticise’ the police and establish ‘law and order’ in a violent crime-ridden society; to ‘improve health and education’ through bringing health insurance to 70% of the population. Yet in no way is Khan sympathetic to the interests of Pakistan’s working class or rural farmers. He is set to follow the dictates of the IMF as the ‘solution’ for Pakistan’s continuing economic failure. And that means his policy ‘aspirations’ will never be met. The reality is that Pakistan’s stuttering economy is entering yet another period of slump and crisis after a short boom. The IMF’s last report reckoned that Pakistan was growing at 5-6% a year. But this was only being achieved by cheap money policy from the central bank, fiscal spending and a rising current account deficit. Foreign exchange reserves have fallen to just 2.3 months of imports as the authorities tried to support the currency despite the deteriorating economy. 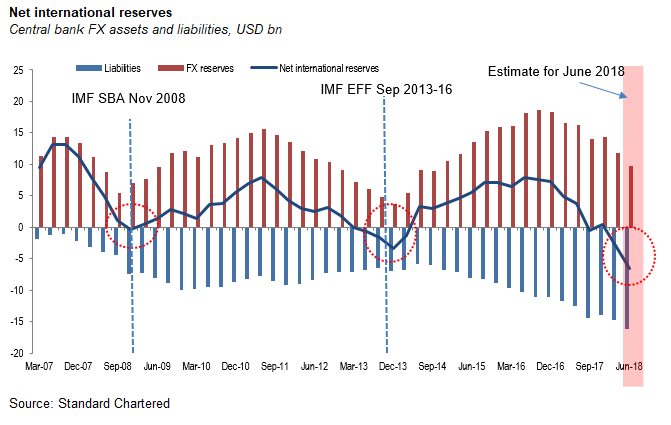 The trade deficit and upcoming FX debt repayments will double external financing needs, taking a further toll on foreign exchange reserves. 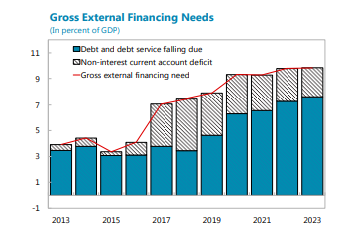 Pakistan will soon require an IMF funding package to pay its way, and with it, will follow yet another period of ‘austerity’. Although there has been some improvement in human development indicators in Pakistan since 2010, youth enrolment in higher education and skills training remains very low. In health, stunting is chronically high among children under five years of age, with 44% in this age group being either severely or moderately stunted. A large proportion of the population still does not have access to piped water at home or toilets linked to a sewage system. There is little in public funds available to deal with these problems because the rich pay little or no tax. Less than 1% of the country’s working population file income returns. Of the 72,000 or so firms registered in 2016, less than half filed returns. And of those that filed returns, half paid no tax at all. Pakistan aims to increase tax collection to 15% of GDP by 2020. But growth in direct taxes is actually slowing because of a sustained reduction in corporate taxes. Most taxes are indirect i.e. through consumption purchases, which hit the poor the most. Investment by the capitalist sector is just 11% of GDP (and falling), with another 4% from the public sector. This compares with China at 45% or even most less developed countries at over 20%. Most income held by the rich goes into real estate and financial assets (much of it spirited abroad). Exports make up just 7.6% of the country’s GDP. That’s nearly 17 percentage points less than than the average for middle-income countries overall. What the country does export tends to be low-value-added products, like cotton and rice. Pakistan is the 115th most competitive nation in the world out of 137 countries ranked in the 2017-2018 edition of the Global Competitiveness Report. As a result, Pakistan relies on an ever-decelerating flow of remittances and outside funding, which makes it highly susceptible to external shocks. As Khan takes over (with the military behind the scenes) Pakistan is facing another balance of payments crisis. The Pakistan rupee is diving as a result as FX reserves run out. Without Chinese investment and funding, the crisis would already be upon the Pakistan economy. The China-Pakistan Economic Corridor (CPEC) is a collection of infrastructure and trade projects, valued at up to $63bn. It has become the centrepiece of China’s $1 trillion-plus Belt and Road Initiative (BRI). From shoddy ports and expressways to inefficient power plants, the Chinese-funded CPEC aims to resolve many of the shortcomings that have stifled Pakistani manufacturers. 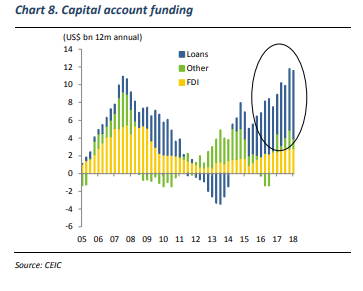 The flow of loans to Pakistan has surged since 2015. All this means that the Pakistan ruling elite must choose between the IMF for future funding or rely on the ‘goodwill’ of China. Over to you, Imran Khan. This entry was posted on July 25, 2018 at 7:51 pm and is filed under capitalism, economics, marxism. You can follow any responses to this entry through the RSS 2.0 feed. You can leave a response, or trackback from your own site. Illustrative article characterizing the elections. Without free press it might be complex for relevant alternatives to show up. It seems to me that [So the ‘no vote’ party was the biggest winner. ] “no vote is no a party”. In the same manner there are people who do not participate in laundry money there are people who do not participate in laundry inferior governance models such as democracy. I wonder why, Michael, you follow the mainstream and call Pakistan and India democracies. It seems to me whenever there “democratic” elections” in a country, that country is automatically baptised as “a democracy”. What about most of the other aspects of the Pakistani society? From unions, freedom of speech, the economy, foreign policy, poverty, etc are they “democratic”? Nadim, you are right. In my facebook post, I did put ‘democracy’in quotes and failed to do so in this post. An oversight. Having the right to vote once every five years in a partially rigged election with no fair media coverage for all; where speech, meetings, strikes and other actions of working class defence are restricted etc is hardly ‘democratic’. So the word is at the lowest level of definition. But Pakistan is not a fascist or even (openly) a military state (for now). Even Turkey is not yet that either. Of course they are oligarchies, as are all capitalists states. If Pakistan and Indonesia are ‘democracies’ when was this democracy introduced and by whom? The people who have the power to do the introducing equally have the power to do the abolishing i.e the oligarchs. Aristotle explained all this in his ‘Politics’ some 2300 years ago: elections are the mark of an oligarchy. Even the former president, Carter, acknowledges that the U.S. is an oligarchy. It is time for Marxists to catch up.